Pools that have darker tiling and darker edges have become very popular recently, and can drastically improve the aesthetic of your area. Dark blue and green flooring has the added advantage of making your pool look deeper than it is, and the colors tend to be more soothing to the eye. If you want your backyard to have a calming vibe, a darker pool is for you. A pool ledge is a shallow part of the pool that protrudes inward from the edge. Pool ledges can give your pool the additional space, and can even be used to place your loungers on a hot sunny day. A pool ledge also works well for children, since it gives them a safe and shallow part of the pool that they can play in. Adding a ledge can give your pool and overall more dynamic look. While infinity pools are often associated with luxury resorts and spas,they have become a more common household trend recently. An infinity pool is designed so that the water line of the pool looks like it is touching the water line of the natural body near it. These pools can make the entire landscape look incredibly scenic and beautiful. 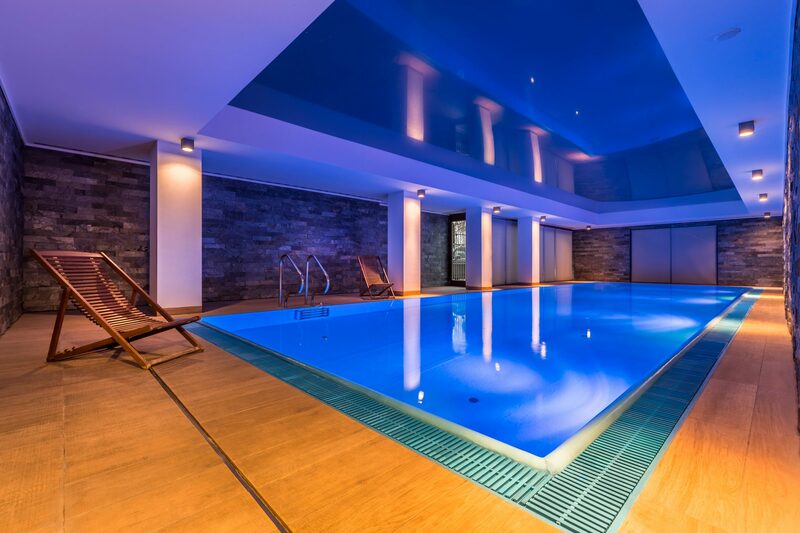 With how much technology is being integrated into our homes, it is no surprise that smart pools have come forth as a trend does this year. Smart pools use a combination of devices to improve their efficiency and make the process of maintaining the pool a lot easier. Smart pools can help you clean your pool, adjust temperature controls, turn on lighting with just the click of a button. Minimalism and monochrome tones are a classic pooling trend. Sticking to this theme is a great way to give your home an added touch of sophistication. A pool with white or light blue tiling or spa colors tend goes well with this theme in a classy, yet functional way. When trying to achieve the monochrome look, make sure that you don’t add any bright colors, since that can take away from the theme that you are going in for. Elevated pools that are made slightly above the ground. This trend is becoming more and more popular for those who want to go in for a unique design that is sure to grab onlookers’ attention. Elevated pools add a nice modern touch to your outdoor area. Innovative placement and structure can give your pool its own unique flare. Pools don’t always have to span over a large area. Sometimes compact pools can add just as much grandeur to your home. 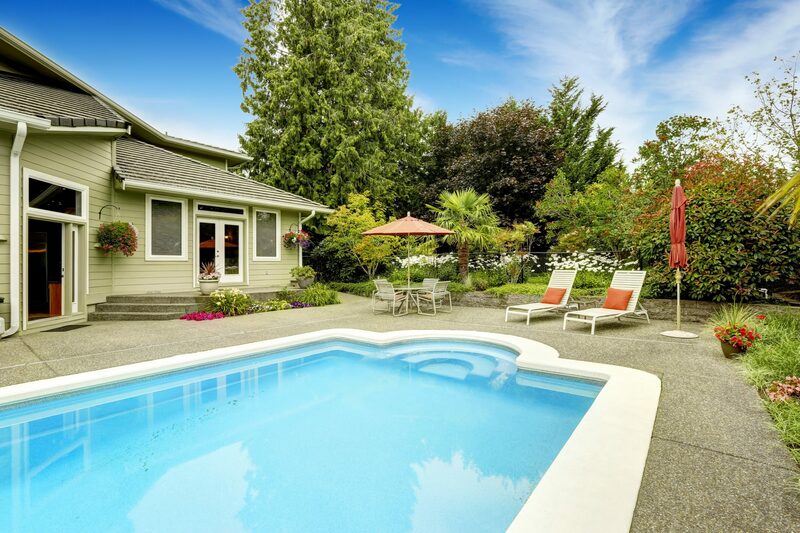 Pools that are smaller are ideal for those who don’t have as much space for a full-scale pool. A smaller pool fits well with a landscape design that has seating areas, a grill to barbeque and any other kind of outdoor essentials. Things like fountains, water jets and other kinds of pool decor and add-ons can help personalize your pool. Finding additions that match the theme and color scheme of the rest of your home is key. Your landscape designer is the best person to talk to about this since they can give you a creative insight into how you can achieve your desired look. Making your pool look as bright as it can seem to be a big trend in 2018, and LED lights are the perfect way to be able to do so. LED lights are available in an incredibly wide range of colors, giving you lots of creative freedom with the look of your pool area. Using LED pool lights tends to be a lot safer than other kinds of pool lighting. 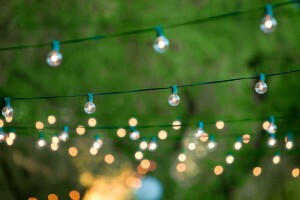 There are several different kinds of LED lights, some of which come with app-based automation that enables you to change the color of the lights, as and when you please. If you are interested in any of these awesome pool customizations or want to learn more about getting a pool in general, contact your experts at Hidden Creek Landscaping today! Fire Features. Fire features are becoming a must-have item for outdoor areas, serving as a focal point and a source of warmth and light in the evenings. From gas fire pits to traditional wood burning fireplaces, homeowners are seeking to create ambiance and add style. Fire features can be purchased and installed right out of the box, or they can be custom made to fit a specific area or achieve a certain look. High Quality Furnishings. 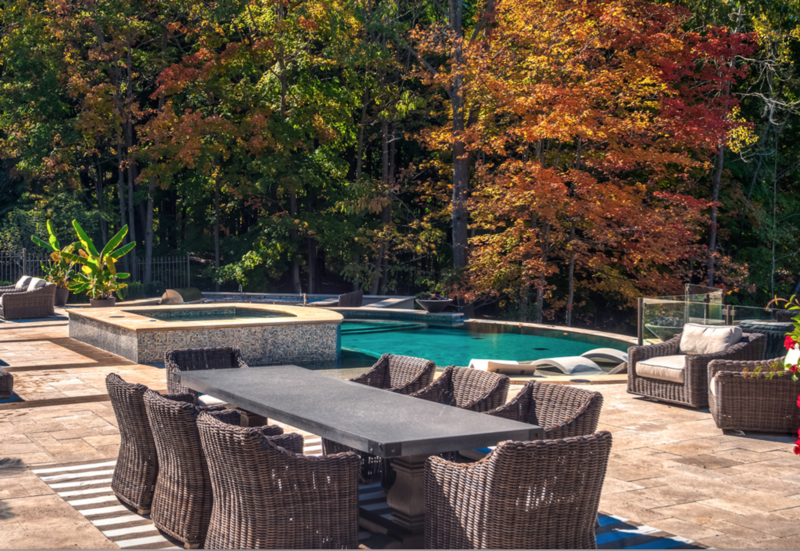 In order to make an outdoor living area a true extension of the home, it needs comfortable furniture. Homeowners should invest in quality furnishings that add style and comfort, allowing them to create a true living and dining space that the family can enjoy throughout the year. Ample seating also makes entertaining a breeze, giving guests plenty of spots to sit down and relax. Edible Landscaping. With a beautiful patio or deck, it makes sense that homeowners would want the surrounding landscaping to look great, as well. However, maintaining the landscaping can be both costly and time consuming. One popular trend is edible landscaping, where gardens filled with herbs, vegetables, and other produce are combined with more traditional gardens of flora and fauna. Plant beds are both practical and convenient. Growing fresh herbs is a great way to add fragrance to outdoor areas, and they can also be grown in stylish pots and planters. Edible landscaping is low maintenance, making it an obvious choice for busy families. 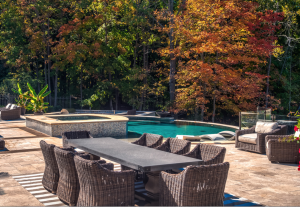 Creating a comfortable, functional outdoor living area continues to be important for homeowners. From fire pits to fresh foods to stylish furnishings, there are many great ways to enhance outdoor spaces. These 2016 trends are likely to continue being popular with patio lovers for a long time to come.